I have to admit that I haven't spent a whole lot of time making bags. I tackled the Weekender and have made a few totes but that's about the extent of my bag making skills. 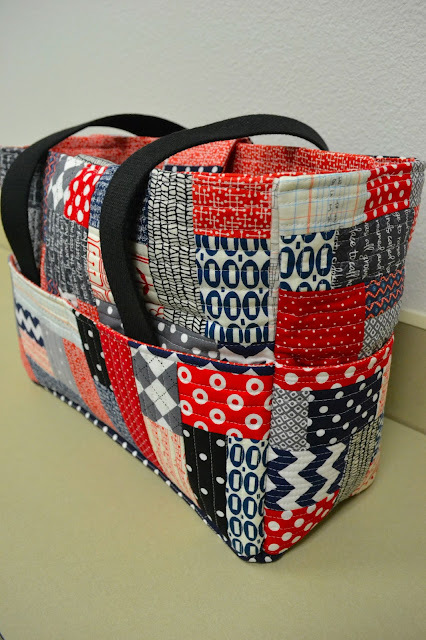 About a month ago, a wonderful lady that I work with asked me to make a diaper bag for her daughter who is expecting. She didn't give me a whole lot of information to go off of, I had to beg for a color scheme! Basically, she told me, "just do what you do"! I don't know about you, but that made me nervous. She was paying for the bag and I didn't want her to end up with something that she didn't want. But no matter how many questions I asked I always received the same answer, "just do what you do"! So I went to one of my not-so local quilt shops and picked out some fabrics in the colors that she suggested. I found a pattern in one of Amy Butler's books, Little Stitched for Little Ones, and I went to work. I didn't follow that pattern exactly. I made a few adjustments by adding a closure. I also added pockets to the front and back panel. And I wanted the quilt as you go type of look. 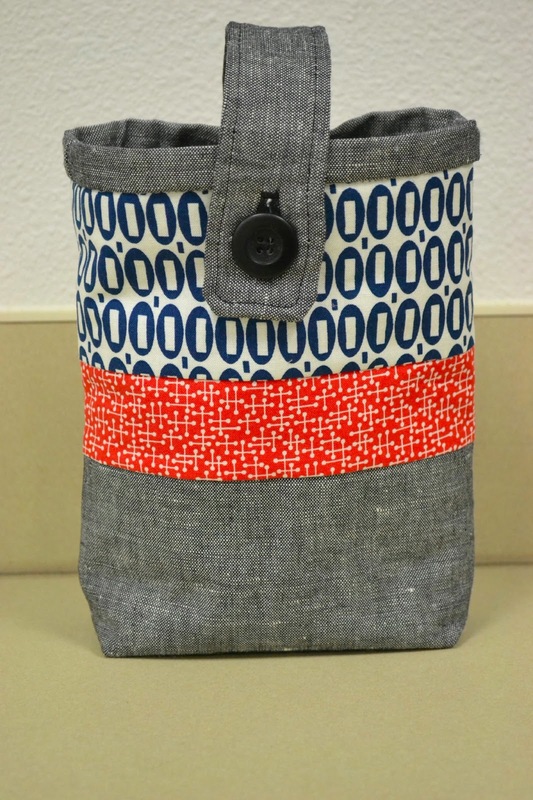 Also, instead of all of the interfacing, I used cotton duck, just like I did with my Weekender. It might be difficult to tell by the pictures but there is a center divider. Also there are elastic pockets all along the inside. I love the closure. It's not too big to get in the way but it's enough to keep the bag contained. And because I love the wonderful lady who asked me to make this, I made something extra just from me. This little diaper pouch should hold 2-3 diapers and some wipes. I used the tutorial by Noodlehead and it was such a quick project! Whenever we have kids, it will definitely be something that I will make again! You can find the tutorial here. I was so pleased at her reaction when I presented the bag. She loved it! Thank goodness! I feel like I have been so unproductive in regards to sewing this month. The hubs and I have been super busy with big life decisions lately! Not to mention, I have been in the process of redecorating our master bedroom. We had been thinking about moving. We had a person interested in our house and we found a beautiful home, but in the end it didn't feel right. So we have decided to stay where we are, and even though our home is on the small side, I'm really happy about the decision! It's amazing how events like that can make my sewing time non-existent but I'm getting back into the swing of things! So while I am finishing up some projects, I thought I would show you a fantastic find that I stumbled upon last week. Like I had said earlier, we are in the process of redecorating our master bedroom. 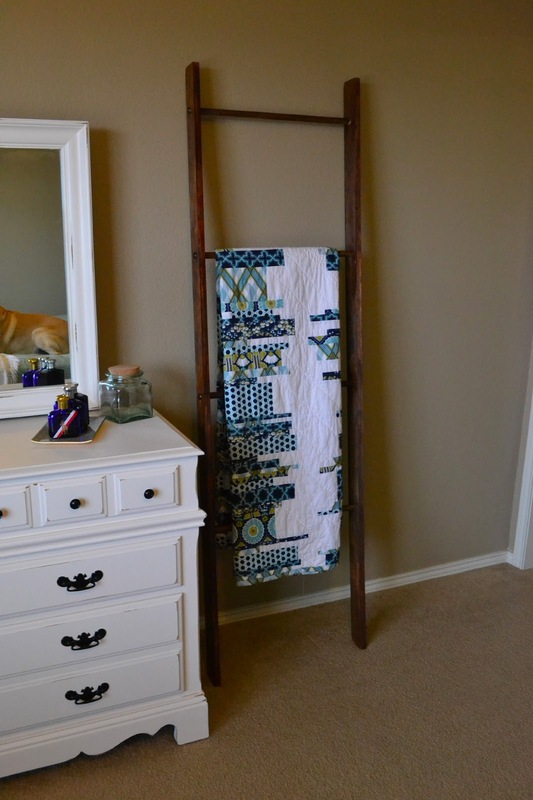 I had wanted a quilt rack of some sort to display some quilts, and I decided that I wanted a ladder to prop against the wall. I looked everywhere I could think of and couldn't find one at the price I was willing to pay. Until...... I stopped in at one of my not-so local quilt shops. It turns out that the father of the shop owner makes these and sells them. It was just what I was looking for and at a great price! All I have left to do now is figure out what quilt I will be making for the bed, and then a few finishing touches like lamps and whatnot. 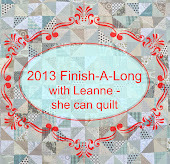 Thanks to Rhonda at Quilter in the Gap I had such a productive year in 2012! And when I saw that Leanne was hosting the 2013 Finish-A-Long, I just couldn't resist joining in the fun again! But I must be honest I don't have as many UFO's as I usually do! So here they are! 1. I need to finish this commissioned quilt. 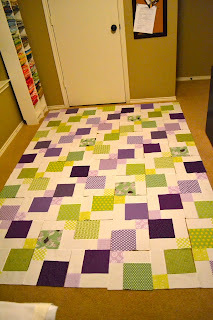 It needs to be quilted and bound. 2. I am working on a quilt for our master bedroom. The top is finished, so now I need to get the backed pieced, have it quilted and then finish the binding. 3. I have a commissioned diaper bag that needs to be done by the end of January. All of the materials have been purchased, pattern has been chosen and I need to get to work! 4. I have a pillow cover that I need to finish. I have the pillow top done but I need to add the back and I am thinking about binding it. Normally I use zippers for a closure, but I might switch it up a bit this time. 5. I also have two pillow shams that I need to piece together. 6. And last but not least, I have a sewing kit that I need to finish. I just can't seem to get motivated to finish this project! It wouldn't take very long but I just can't pick it up. The link-up party ends today so you still have time to enter if you are interested! You can link-up over here! And thanks Leanne for keeping a great thing going! A Lovely Year Of Finishes! I have decided that I wanted to start this year by linking up with A Lovely Year of Finishes! I was so proud of myself for completing most of my projects from 2012. The only two remaining projects are two quilts that I will be sending off to the long-armer next week! I am pretty close to starting 2013 off on a clean slate! And as a result, I have decided to dedicate this year to skill-building! There are so many things that I would love to accomplish this year. I have jotted down a short list in an attempt to stay focused! 1. Try making more bags. 2. 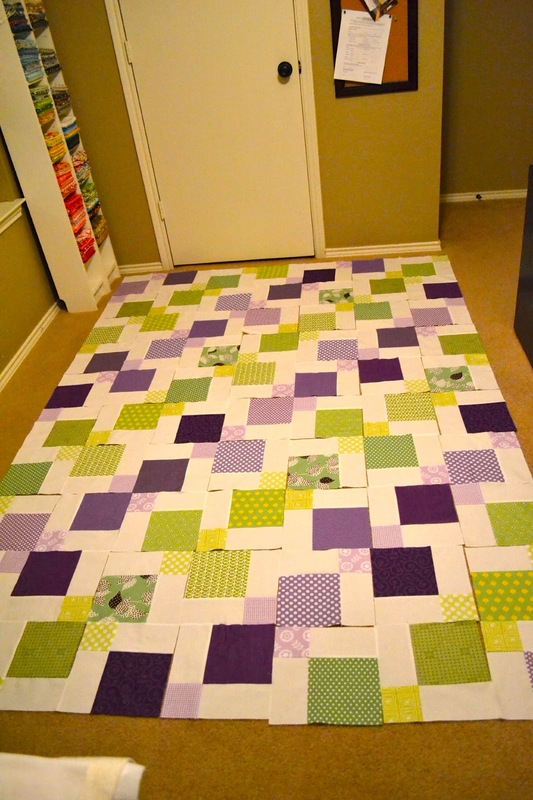 Try and learn how to use my copy of adobe creative suite to design quilts. 3. Have a pattern published in a printed publication. 4. Become more comfortable with free motion quilting. There are tons of other things that are on my to-do list but these are goals that I really want to accomplish this year. 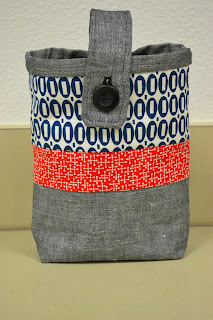 Consequently, I thought about what I wanted my first project of 2013 to be and I have decided on a diaper bag! A friend at work has a daughter who is having a baby and she asked me to make a diaper bag for her. Since it fits in with one of my goals for this year, I just couldn't resist! I have a few new techniques that I would like to try with this project as well! The pattern and fabrics have been chosen, and I have thought about making a few adjustments so hopefully this will go smoothly! I don't know if you have heard of the Pillow Talk Swap on flickr but it is one of the best swaps ever! The talent in the group is absolutely incredible and I was lucky enough to be a part of the last round. My partner asked for a pillow using a teal color scheme and loved the idea of non-square patterns. So So for the first time ever, I tried some curved piecing with this pillow. I was pleasantly surprised with how easy it turned out to be! And luckily my partner loved her pillow! I was lucky enough to receive this gorgeous pillow in the swap. My favorite colors are blue and green and these colors fit perfectly in my music classroom. This pillow now has a home on my desk chair in my classroom. It makes me smile every time I see it! This pillow is part of my 4th Quarter Finishes so I will be linking up with the 4th Quarter Finish A Long. You can see my original post here. I have a very special friend who asked me to make her a cash wallet. She follows the Dave Ramsey financial system which is pretty amazing if I do say so myself! I was able to finish this a while back and I even had time to make one for myself! I used this pattern as a starting point. The pattern however has raw edges which I did not want so I made a few adjustments. It was relatively a quick project that I completed in an afternoon. Luckily, my friend loved it and has been using it ever since! I'm linking up with the 4th Quarter Finish-A-Long!